Monty has some unusual habits. None of my other cats has done some of the things he does. They can be a little irritating sometimes, depending on my mood, but I also find them humorous. I am pretty picky about keeping the house clean. I consider it really important when you have as many pets as we always seem to have. 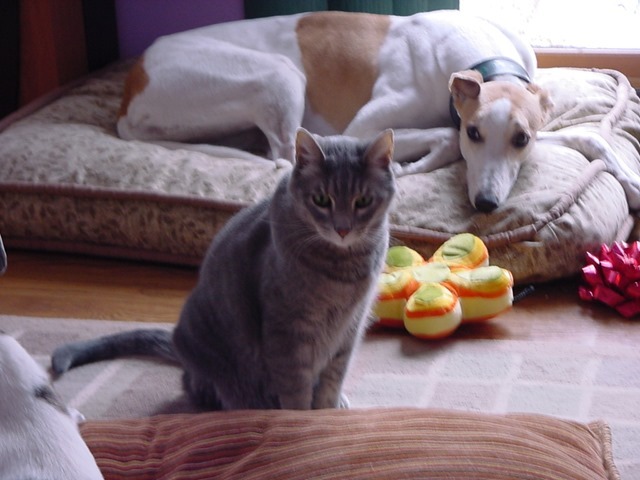 Blew, one of my greyhounds, has a *very* touchy stomach and just can not eat anything out of the ordinary or it sets off some terrible gas and runny stools. So I always make sure there is nothing on the floor that he will eat, else we both pay the price. (yep getting back to Monty now) Anyway, Monty is always challenging me in the clean floor department due to the fact that he likes to walk around while he eats. He eats very loudly, and I don’t he even has it in him to just stand over his dish and eat. He also doesn’t eat the ‘ends’ of his food, only the middles, so that leaves all of the ‘ends’ all over the floor as he strolls around chomping. I have an island in my kitchen and when Monty is finished I take my DustBuster vac and whip all around there getting up all the ‘ends’ of Monty’s food. By ‘ends’ I mean his food is little x’s and he eats the centers of the x’s and leaves the rest all over the place. He is very old, though healthy, and needs to eat several times a day so it is ongoing though out the day. Blew, on the other hand, knows that Monty does this and will go out there looking for Monty’s ‘ends’ and if I don’t get to them all before Blew finds them it is 24 hours in a gas mask for me!